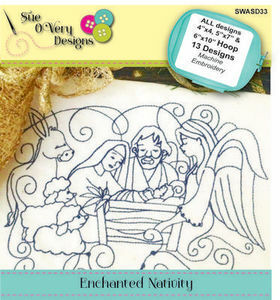 Nativity scenes have been popular for centuries with artist such as Michelangelo, Raphael, and now Sealed With A Stitch. This one single moment in time is a loved Christmas tradition for many Christian families. Every holiday season around the world, treasured Nativity sets are carefully unwrapped from tissue paper and meticulously arranged. Mary holding and looking down at Baby Jesus with him looking at her - Mary and Joseph holding and looking at Baby Jesus - Three wise men silhouette following the star - Baby Baby Jesus swaddled in manger with heart above - Mary, Baby Jesus, Joseph in manger and star above silhouette - Mary, baby Jesus in manger, Joseph and the words Rejoice Christ is born.